One of the things I've come to most enjoy in nature based art is the combination of various things that you might see in nature all at the same time. Yesterday it was the first Mourning Cloak butterfly of the year, a Brown Creeper, probably on his way north for the summer, and a singing Carolina Wren, probably establishing territory, though with them sometimes you think they might just be singing for the fun of it. I did very minimal sketches of each while I was out at the Wissahickon yesterday. And as I've said I like the Stillman and Birn sketchbooks for working through ideas. Today I know I wanted to use the Caran d'Ache Neocolor II water soluble crayons and that due to all the subjects I'd probably need to work larger. So I chose the Delta 9x12 sketchbook. To repeat myself one more time I also like the luminosity of the Neocolors and thought they might work well here. I still think this could probably use some minor improvements. But I got what I wanted - a believable version of yesterday's walk in the woods. Hopefully one day it will end up as a more finished painting or print. I have a lot of photos that I've taken of birds over the years. This may come as a surprise to some given how much I write about the problems of relying on photos in art. It's true. I think more bad art has come out because of the use of photos than vice versa, not that this view is based on any scientific studies. I suppose it's similar to birders I meet who want to rely on some digital technology to confirm the bird that they see or hear. Yes you may get an ID that way, just as you may get some likeness of a bird if you rely solely on photos. But what's the point? You're missing all the enjoyment of learning something, of interacting with the world, of portraying the excitement of that interaction. 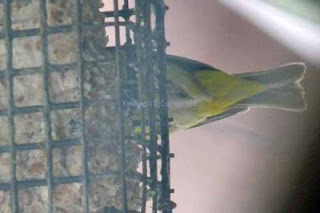 Would you rather interact with the bird or the photo of the bird? Still when I started I knew so little about the structure of birds that I found I was also trying to take photos of them when I saw them rather than just look at them or try to sketch them. Now over six years later I tend to look and sketch first and only take photos later. Even with photos as a secondary motive I've ended up with a fair amount of them. And when I'm searching for an idea for a new painting or print I often flip through them. In doing so there are always a fair number that I reject out of hand: poorly seen bird, dull composition, impossible pose, and quite often, cliche, or fear of cliche. That's always the case with Piping Plovers. They always seem impossibly cute, at least by human standards. I'm sure they don't look cute to the nearby American Oystercatchers. Still I know that they'll seem cute. I can't even tell if that's why I'm attracted to them. But I also know that no subject should be out of bounds for a true artist. A talented artist can always breathe new life into overdone subjects. Still that fear of cliche stays with me. Everytime I look through my many Piping Plover photos something scares me off. And that is the one beauty of the surprise project of using a number of Stillman and Birn sketchbooks for examples for a demonstration on their use. For me it takes the pressure off. I can give subjects I normally shy away from a try. That's been true of almost all of the work I've done over the last week, with the exception of the Eastern Phoebe. Today's Piping Plovers was another. I decided to concentrate on drawing the birds, something that turned out to be far more complicated than I expected, and then to just experiment with Caran d'Ache Neocolor II watersoluble crayons for color. I also decided to stick with the smaller 7x10 Gamma sketchbook, one that really doesn't like too much water. I thought I could get around the problem of too much water by just being spare with both crayon and water to turn the marks into washes. And that's exactly what I did. 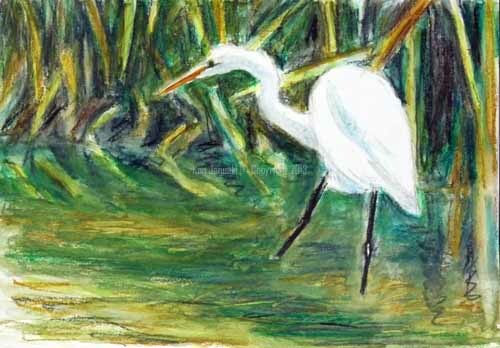 I just made faint crayon marks on the birds and then used a small waterbrush to move the color around into larger areas. With the sand I basically just made small dots or marks with the crayons then used the waterbrush to smear them and blend them into one another. This was an experiment but I think it turned out pretty well. One additional thing is the luminosity of the Neocolors. This is something I really liked. Though I knew the background here might be too simple and too boring I hoped that the richness of the colors would be enough to offset that. I think, at least to these unbiased eyes, that it turned out that way. As I've experimented with the Stillman and Birn Gamma sketchbooks over the last few days I've learned that it's best to keep to a few simple washes. Otherwise the paper buckles and you can't really even draw or paint a straight line after that. All well and good. But I can't resist going on to do more washes. 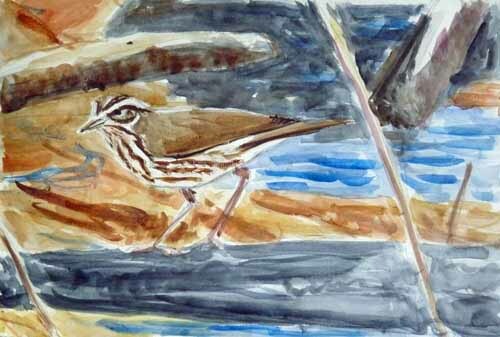 In this case I spent at least 30 minutes on a drawing of a Northern Waterthrush seen at Magee Marsh a few years ago. This is based on a photo I took. It may not seem it to many viewers but I'm a stickler for color and color orchestration. As best I can tell that's why I keep reworking these way beyond what the paper tells me I should do. The paper does hold up though. So at the end, though I may not be able to draw straight lines due to the buckled paper, I can still put one color on top of another until I get something that looks right to me in terms of color and composition. I think that this use of many layers of wash and color works a bit better on this, and to a certain extent on the Eastern Phoebe and Great Blue Heron, because I'm spending more time on the initial drawing, particularly in the birds themselves. This allows me to be somewhat detailed on them, and then be freer and looser on the background. So in the end there's at least to me a pleasant combination of detail and inexact suggestion. This will never pass for a finished watercolor. Neither would the Eastern Phoebe, especially if you saw either in person. This is much less so of the work over the last week on the Delta paper. Still I find the paper and the paintings very worthwhile. 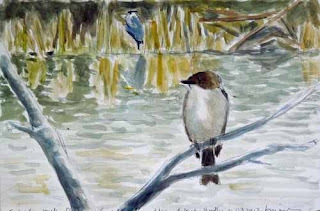 Already I'm thinking of doing an acrylic painting of the Eastern Phoebe. Tomorrow I'll probably be thinking the same thing about this work. I do look forward to the arrival of some new Stillman and Birn sketchbooks. I'd like to continue to experiment with more finished work on the heavier paper, especially that of the new Zeta sketchbooks. This has been an unplanned diversion. But one that I think is paying off, and fun to do as well. First of Year Eastern Phoebe - 2013. Watercolor by Ken Januski. For many years a field that I've really enjoyed, though strictly on an amateur basis, is phenology - the timing of natural events. 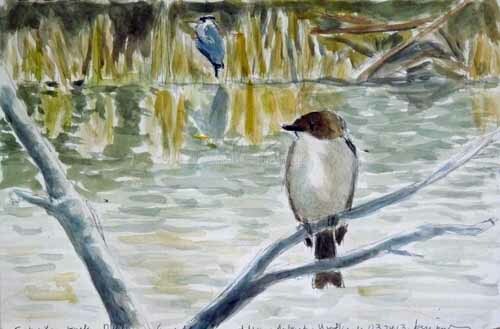 The pencil and watercolor sketch of our first of 2013 Eastern Phoebe above illustrates this. It's not just pleasurable to see the first Eastern Phoebe of spring it's also enjoyable and comforting in a way to see that the world still operates in more or less the same manner. There is a continuity and consistency in nature from season to season and year to year. The Eastern Phoebe, outside of members of the blackbird family, will be among the first migrants to arrive in our area each year. And generally it will be on a cold, gray day, one not very promising of the warmer weather of spring. But once you see a phoebe you know that spring really is on its way. And another change of seasons is evident. For those who pay attention to nature this is something to be celebrated and enjoyed. The gist of the article was primarily scientific. People were interested in nature, in phenology, and perhaps as well in climate change. But it wasn't an a priori part of the study, done solely to prove that human activity is destroying nature. But you'd never know that to read the comments. I know better than to read comments on the page of any newspaper site. As someone who spent over 25 years in the newspaper industry I find this incredibly sad. The comments almost invariably bring the conversation down to the lowest possible level. It would be an insult to Troglodytes to call most commenters Troglodytes. They don't even reach the level of a society or culture. Finally I decided that what best described them was the 'brutish clan' of the title of this post. If it were me I'd banish them from all newspaper sites. I assume that they do get some viewers, in fact quite a few if you count the number of comments, but their level of stupidity and hate always makes me give up on them within minutes. Occasionally there will be a thoughtful comment but it's immediately lost in the rabid responses. Who knows how the people who make the thoughtful comments have the patience and stamina to post? I've read newspapers and others who defend the practice of allowing these comments. But I have to disagree. In any case when I last looked there wasn't a single intelligent comment on the phenology article - just rants on government spending, tree huggers, climate change conspiracies etc. As I said it is a brutish clan. But that doesn't lessen the value and appeal of it. We are all a part of nature and we're all affected by it, farmers, people affected by hurricanes and tornadoes, fishermen who look to the bloom of shadbush trees for running of the shad or appearance of trout. If I feel sick from tree allergies I know it's time for my taxes to be filed. I like the idea of illustrating natural events. 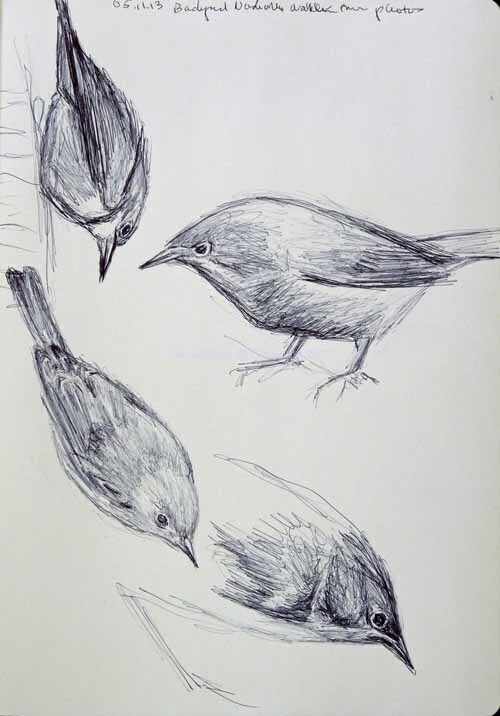 So that's why I did the Eastern Phoebe sketch. We also saw a couple of Great Blue Herons at Morris Arboretum yesterday. I'd been reading about people seeing large numbers of them in flight in Pennsylvania this week. They must be migrating and I assume that the two we saw were migrants. 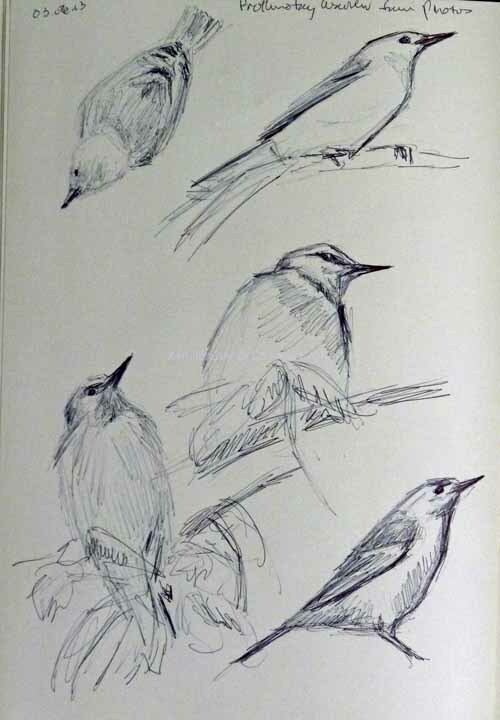 The sketch is based on photos of the Eastern Phoebe as well as sketches of one of the Great Blue Herons. It's done on Stillman and Birn Gamma paper, a lighter weight than that of the Delta sketchbook I've used in last two posts. As I said in recent posts I like all of the S&B sketchbooks for working out ideas. So in this one I tested a composition that combined the phoebe and heron. They never appeared like this in reality. Since the paper was lighter and the subject, the phoebe, a bit more delicate I decided to use pen and watercolor rather than the Neocolors. When I use them I tend to work and wet the paper more heavily and I think it would have been too much for the Gamma paper. But for what I did it was fine. The paper does warp a bit but I always put a rubber band around the lower edge when I'm done. That and being flattened by the weight of the closed sketchbook once it dries help to flatten it back out. I've done a number of first of year phoebe drawings and paintings. This is by far the one I'm happiest with. Sometimes a commission, deadline or other such thing will give me the impetus to stop thinking about what I want to do next and just do it. Such has been the case with the invitation to demonstrate some wet media work on Stillman and Birn sketchbooks next month. 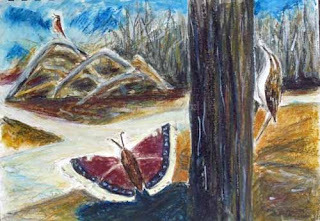 Above is another 9x12 inch Caran d'Ache Neocolor II water soluble crayon work on Stillman and Birn Delta sketchbook paper. Like yesterday I started off with a pencil drawing. I'd say I spent about one hour on it and two hours on the painting. Once I had the egret looking the way I wanted, though his pose looks a bit off now, I started adding color. I originally bought the Neocolors a few years ago because I wanted a way to quickly add color when working from life outdoors. Sad to say I never got them to work for that and in fact was generally too intimidated to even try. Instead I used them in the studio after the fact to work from sketches and photos. As with any new medium there is a learning curve. The odd thing about them is that they are a linear medium, a medium that makes marks. But because they are water soluble they're also a shape and mass medium, a medium that makes areas not lines. That is the rub in learning how to use them. A number of people whose work I've seen online seem to favor using them as a light wash to accompany the strong outlines of a pen or pencil drawing. And that's fine. It may in fact be their most appropriate use. But I find that I want to use them to make a painting. So I start off with the lines of the crayon but soon have a work that is mainly masses of color. What I like about this, and about being able to use them on the Stillman and Birn paper, is I'm able to do a small scale painting with minimum fuss. I can get many of the richnesses and complexities of oil, acrylic and watercolor on a sheet of paper. And the paper holds up to all the work and all the water. I suspect this is why I think the combination is so good for working through ideas for future paintings. One thing about the Neocolors is that they are fairly bright. Not everyone will like this. But for me it's just my cup of tea! Blue Grosbeak at Higbee Beach. Multimedia drawing by Ken Januski. A few days ago I got an email from Stillman & Birn, makers of high quality sketchbooks, to see if I'd be interested in doing a demo using their sketchbooks at nearby Merion Art and Repro Center. Before I answered I wanted to go through my Stillman and Birn sketchbooks and reevaluate them. What I found was not a complete surprise: I've used them mainly to make studies for more developed work. Not that I haven't used them for finished work as well. In fact I've used them for just about everything: ballpoint pen, ballpoint pen and watercolor, pencil, watercolor, pastel, oil pastel and Caran d'Ache Neocolor II Crayons. I've used them for both short studies and more developed work. What's particularly striking is that I can find almost all of these media used in just one sketchbook! That's very unusual I think, to have such a versatile paper. When I talked to Michael from Stillman and Birn on the phone we decided to follow through on the demo. 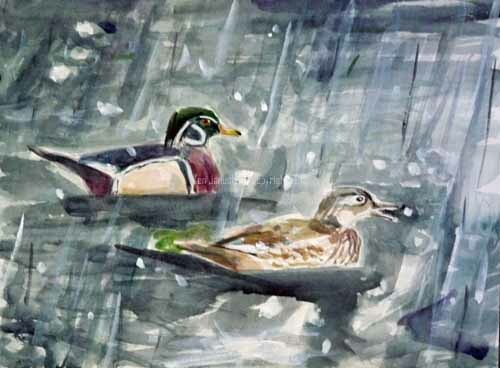 It will be on Saturday, April 27, 2013 at Merion Art and Repro Center and will particularly stress the multimedia, especially wet media, capabilities of the Stillman and Birn sketchbooks. It's been a while since I've used them especially for more developed work so I decided yesterday that it was time to get experimenting. Above is a 9x12 sketch on Stillman and Birn Delta paper. I started off with a pencil sketch of a beautiful Blue Grosbeak seen last October at Higbee Beach in Cape May, NJ. I then started adding color with Caran D'Ache NeoColor II Crayons. As I did so I used first a waterbrush then just a regular watercolor brush to pick up the pigment from the crayons and move it around to create patches of color. I could have made the bird much bigger but I'm not all that fond of bird portraits. I prefer birds situated in the environment in which you really see them - in this case primarily hackberry trees I believe. The problem with using so much of the design for vegetation is that it's easy to make an undifferentiated mess of it. 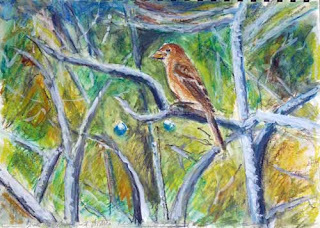 I spent more time on it than I did on the grosbeak. Finally I decided that I needed to add white gouache in order to bring out the light color of the hackberry branches, a color that dominates the scene. That is pretty much the last step here. As I said I enjoyed this. But I think that I can still learn a lot before the demo. So most likely you'll be seeing a number of works in this media over the coming weeks. Once I start seeing new birds, or hearing about others seeing new birds, every day presents a temptation to go out. 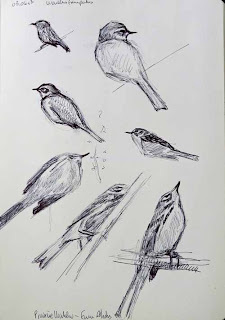 I can exercise, sketch, bird all at the same time. Today wasn't all that inviting but I'd remembered seeing a very early Eastern Phoebe along the Wissahickon last year and decided it was worth a try, even with a weather forecast of rain and flurries. The flurries started almost as soon as I got there. But all it did was make the day more beautiful. Snow always quiets the environment but it does so particularly in a natural setting and even moreso along a stream. In this weather the stream seems to belong to the wildlife not the human visitors. Part way along I heard a familiar squeal - that of the Wood Duck. Though a few had overwintered in the swan pond of Morris Arboretum I hadn't yet seen any along the Wissahickon, nor heard their squeal. As I made my way to Valley Green the two grew to at least 13. The snow came down harder and this female couldn't resist snapping out at a flake. As soon as I saw it I knew I wanted to give it a try in paint. 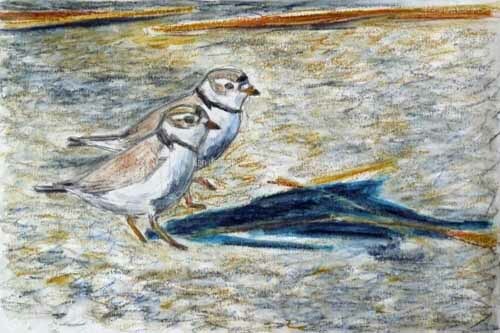 Without the looseness of yesterday's Killdeer painting I doubt I would have tried this. How in the world was I going to render the falling snow, the extreme darkness of the water, the snowflake? I think yesterday convinced me not to worry about it and just improvise. This time of year brings with it many rites of spring. One of the best is hearing Stravinsky's Rite of Spring on the radio. It's the perfect time to play it. And it always reminds me of the difficulty of doing realistic art. Given that work like Stravinsky's has been played for around 100 years how can you paint as though such transformations, beautiful transformations I might add, never took place?! I never know the answer to this. I do know that if there is a cause of anxiety at the back of my more realistic art it's due to being aware of this artistic tradition. In the visual arts of course you can substitute Picasso, Matisse, my old hero Stuart Davis for Stravinsky. Another rite of spring is the return of migrating birds, Eastern Phoebes, Tree Swallows, Common Grackles and as above Killdeer. I was shocked to find one in January or February this year. This pair seen today at the Manayunk Canal is my first pair of the year. It's now time to be on the lookout for nests and young. But the real rite of spring I'm talking about is one I'd just as soon forget - very difficult, overworked watercolors with Killdeer as subject. I'm not sure why I've done so many Killdeer watercolors that have been such a struggle. 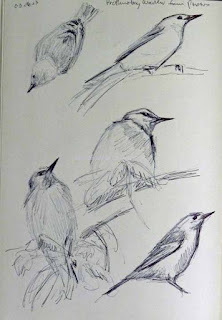 Perhaps its because they're one of the first birds each year that I sketch in the field. I then want to develop them into a painting. My guess is that's the most likely case. But I thought I'd left the struggles behind. 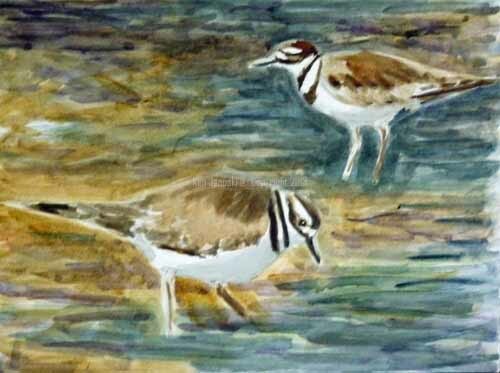 I didn't have any problems with the watercolors of Killdeer I did last year and possibly the year before. That wasn't the case today. I struggled quite a bit on this 9x12 inch watercolor. Though I started off treating it as a watercolor I ended up treating it as an oil or acrylic, where I don't worry about what's already been put down on the paper and keep pouring on paint. This is almost painting through exorcism. A weekend without warblers would indeed be a disappointment if it were April or May, especially if I'd been out birding and wasn't limited to my yard. 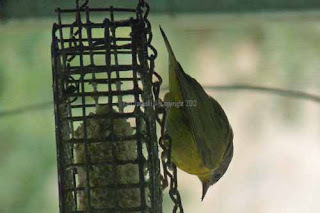 Warblers are quite rare in the backyard, visiting briefly once or twice a year at most. 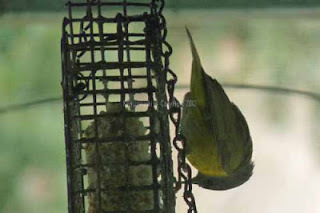 Most of those are Common Yellowthroats. 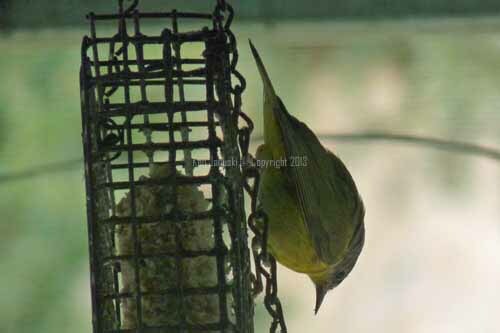 But who can complain about a weekend in March without warblers in the backyard? Well I and Jerene can but I'm sure we won't get much sympathy.We were lucky enough to have a Nashville Warbler in the backyard for the two weekends before the last one. But we last saw him on March 6. Since he'd previously eluded us for a full week it seemed possible he might still be around but I'm pretty confident now that he's gone for good. I did try briefly on the day of his last visit to do a field sketch, something I also tried on the day of his first visit. But he left almost instantly and we haven't seen him yet. Was he really that shy? I'm sure that wasn't the cause of his departure! But it did remind me of how difficult it is to draw warblers, even if they manage the unheard of behavior of sitting still, without the aid of magnification. The details, such as the size and shape of bill, just can't be seen with the naked eye. I took a lot of photos of this bird, more for documentation purposes than anything else. But now that I have them I see how much I missed when just looking with my naked eye. One of the first impressions Jerene and I had of the Nashville, before we'd identified it and I think even before we'd gotten out our binoculars was how long his bill was. And yet when we read about him later I recall that the guides said he had a short bill. Why the difference? This is something that I think comes out in photos or with optics, the true cause of an overall visual impression. The Nashville has a particularly pointed bill. That I think is was made it seem so long when we first saw it. 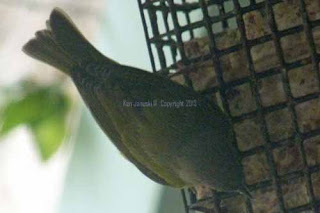 That in turn got me thinking about other warblers and their bills. The Prothonotary always strikes me as having a long bill, though nothing like that of the Yellow-throated Warbler. The Black-throated Blue on the other hand seems to have a bit of a stubby bill. These are my impressions and recollections anyway. I'm sure many birders don't notice bills. They're too busy checking all of the more obvious diagnostic marks used for an ID. More experienced birders of course probably are well aware of these details. In any case the differences in bill shapes of warblers convinced me that I should go through my photos of warblers and do some sketches, trying to capture both the general shape of them, but also their specifics, like bill shape. That is what I've done above with the Nashville from the backyard, some Prairies from near Belleplaine State Forest in New Jersey and some Prothonotaries from Magee Marsh in Ohio. Often the photos still weren't good enough to see all I needed to see. At other times my skills weren't high enough. 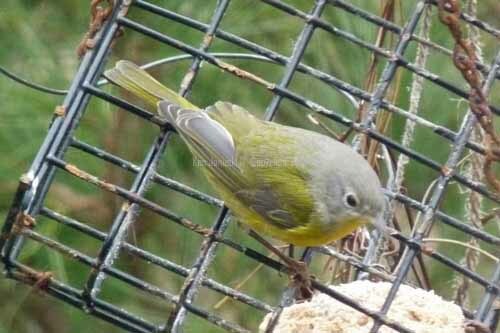 But it's been a useful exercise and one I hope to continue with other warblers. The first normal migrants will soon be here. I'd like to be ready for them. 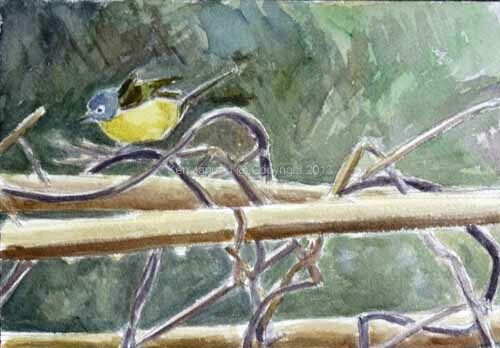 Into the breach one more with field sketches of wood warblers! I was a bit reluctant to title yesterday's post Revisting Nashville Warbler because I didn't want to mislead people into thinking that the bird had returned. It hadn't. A week had gone by with no sighting. Last week my wife Jerene yelled out loudly "Get Down Here Right Now." 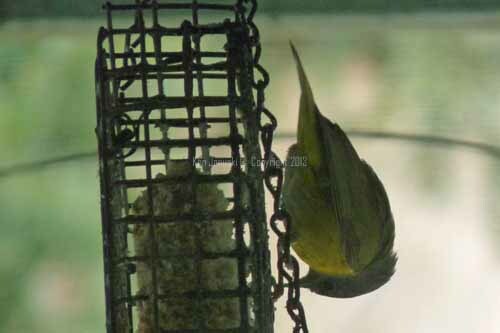 There was the Nashville on our feeders. 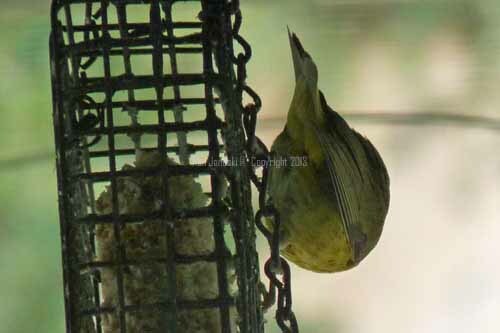 Today she yelled out "There's a bird I don't recognize on the suet." Sure enough it was the Nashville, and allowing better photos than last week. Who knows how he got here but he seems to be sticking around, at least in the general vicinity. When we saw a Nashville Warbler in our backyard last Saturday it was hard to know what to do first: get the binoculars so we could confirm what it was? Get the camera so I could photograph it? Try to do a sketch? 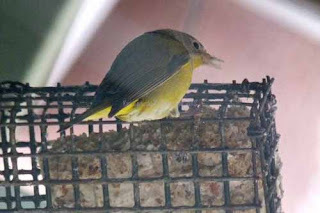 Notify other local birders via the PA Rare Bird List? I took steps one and two first, view him through the binoculars and then run upstairs and get the camera and try for some photos as he flitted in and out of sight for 30 minutes or so. I probably made a mistake with step 3, which is alert local birders. As with any rare bird it makes most sense to see it as well as possible as long as possible and get proof of the bird, either verbal, visual or both. When I came back down after posting the two blurry photos to the bird list I don't think we ever saw the bird again. I assumed that we'd see him later in the day, especially as he probably wasn't going to fly anywhere in the rain. But we never saw him again that day or the next few days. I did a quick watercolor that I posted here but it was unsatisfactory in many ways. Since then I've wanted to do a better version, one that was more accurate in shape and color and also more a finished painting. That is it at top, a smallish 7x10 watercolor on 300# Arch cold press paper. I think it does justice to such a rare scene. I did look on ebird in the following days to see if I could find any other nearby sightings. Though I didn't try every state the closest one I found was Texas! The watercolor above is a reworking of the earlier watercolor of the Killdeer and Great Blue Heron seen at the Manayunk Canal a number of weeks ago. 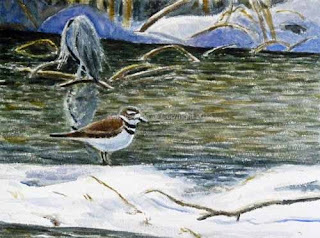 It's the earliest I've ever seen a Killdeer in Philadelphia and I wanted to commemorate it, and the snow and Great Blue Heron in a painting. This was also the second version, but I still wasn't happy with it when I finished it a couple of weeks ago. It just didn't seem to vibrate in terms of color or value. I felt I hadn't taken advantage of a special scene. So I reworked it yesterday for the Manayunk Roxborough Arts Center Members Show. It's not perfect but I think much better now.